A needlepoint hair accessory is the perfect fashion touch to showcase a new hairstyle or freshen up an existing one. This small design lets you experiment with something new while using up leftover threads and canvas from other needlepoint projects. Glam up an evening outfit for a night out on the town, or add a dainty feminine touch to make your casual attire all the rage. 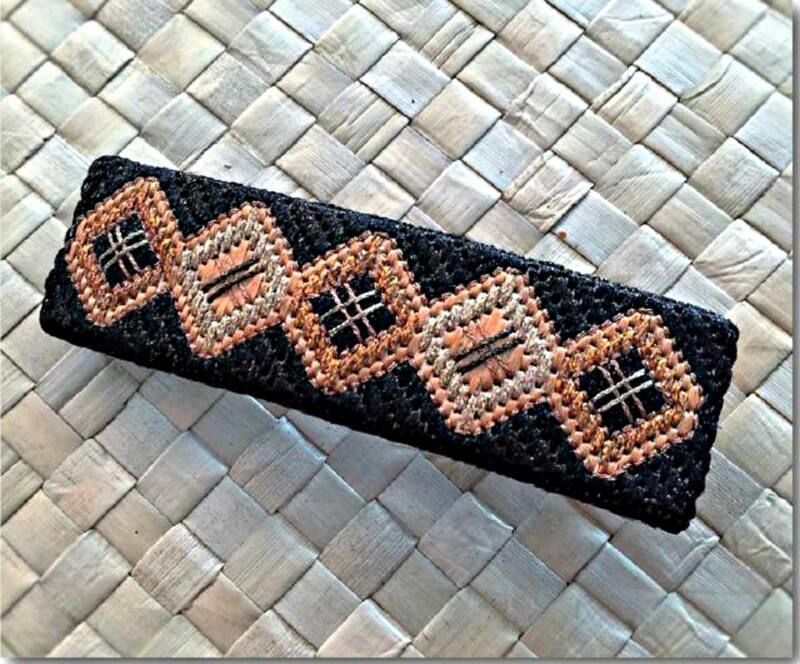 When finished, the needlepoint barrette will be both functional and beautiful, and you’ll have added a cool new accessory to your fashion wardrobe as well. Make several of these needlepoint barrettes with a variety of stitches and embellishments. The pattern can easily be modified to experiment with striking colors as well as stitch techniques that are worked in different directions. With these step-by-step instructions, you will learn how to make a needlepoint barrette from start to finish like the one pictured above. Charted for beginner to intermediate stitchers, this one-of-a-kind needlepoint project invites you to take your needlepoint skills to the next level. All you have to do is pay close attention to stitch placement for the first motif, and once you get the hang of it, you’ll fly through the rest of the project with ease and be delighted with the results. Before you start to stitch, gather these needlepoint and finishing supplies and place them in a project bag for working on-the-go. Please pay close attention to the stitching instructions and needlepoint design tips so that your project is a success. Print a color copy of the Needlepoint Barrette pattern (see above image) to use as a guide when stitching. Cut canvas at least 3 inches larger on all sides than the stated design measurements to make sure you have enough for practicing the stitches and finishing the needlepoint into a barrette. Wrap all edges with masking tape to keep mesh threads from fraying or unraveling; or if you prefer, turn the edges under and whipstitch by hand or machine-zigzag with the invisible thread. Put together stretcher bars and attach canvas with brass tacks, pulling as tightly as possible to get a firm taut surface. Draw the shape of the needlepoint barrette on the canvas. For this project, the shape should be a rectangular bar measuring ​4.5-inches by 1.5-inches. This size provides enough room to turn under a few extra stitched rows when finishing the needlepoint project. Make sure that the shape is centered on the canvas. There should be 2.5 to 3 inches of blank canvas on all sides after the shape has been drawn. Find the top center stitch within the barrette shape: The bold arrow in the top center of the design chart indicates the horizontal center of the design chart. To properly center your first stitch on canvas, count the number of horizontal canvas threads within the barrette shape. Divide this number in half to find the top center thread and place a mark at this point. Sort through your leftover threads and select the colors and textures to use in making the needlepoint barrette. A few odd multi-ply threads will do just fine for working the non-metallic stitches in the design, and only a few scrap pieces of fine metallic braid will be required for surface stitching. Depending on your stitching tension, you may need as much as a full skein of a shiny flat ribbon-type thread for the background fill area. Making a needlepoint barrette is both fun and satisfying. You may decide to make one for a special occasion, or several to match various outfits you like to wear. Either way, once you've prepared the canvas and made sure you have enough thread and other supplies on hand, you can stitch the design in no time at all. The Needlepoint Barrette is mainly worked in an upright Bargello or Long Stitch over two to eight canvas mesh threads, and stepping up or down one thread as diamond shapes are made horizontally across the canvas. For this Bargello pattern, each colored line on the needlepoint chart represents one vertical stitch that is worked over varied numbers of horizontal canvas mesh threads (refer to design chart or above image). For each stitch in the main group of Long Stitches of the outline for each diamond, you will work over 3 horizontal canvas mesh threads to place one stitch. For the anchor stitches at the top and bottom of each diamond, vertical stitches should be worked over 4 horizontal canvas mesh threads. Anchor stitches on both sides of the design are to be worked over 6 canvas mesh threads. To form each diamond shape, step up or down one horizontal canvas mesh thread from stitch to stitch as indicated in the needlepoint chart. The diamond pattern for the needlepoint barrette is repeated 5 times horizontally across the canvas. Each of the 5 diamonds can be stitched in different colors or exactly alike. This project uses an alternating color scheme to stitch the needlepoint barrette. You may wish to make the first barrette exactly like the one for this project; and then experiment with different colors, threads, and embellishments for additional barrettes. Here's how to stitch the project. Thread the needle with 2 to 3 strands of non-metallic thread. Since the Long Stitch is a straight stitch, more strands of thread are required in the needle to get adequate canvas coverage than for diagonal stitches. As a result, if using Persian Yarn, you will need to thread the needle with 2 strands. Cotton Embroidery Floss or Silk will require 3 strands. All thread strands should be cut to no longer than 18 inches for this needlepoint design. Starting at the top center stitch you have already marked, count two horizontal canvas threads down and place your first stitch. Continue working the inner outline of all 5 diamond shapes, completing each shape before moving to the next. Use the outline chart above to carefully count the canvas mesh threads of each Long Stitch for correct placement. Stitch the outer outline around the completed diamond motifs with the metallic braid you have selected. Work the center of each diamond over 2 to 8 horizontal canvas threads to create a smooth satin look. When this area has been completed it will look similar to a Hungarian Stitch pattern. Use two different colors of metallic braid to make large surface embroidery cross stitches over the center fill area you've just completed. Follow the full needlepoint design chart to work the background fill area with the shiny ribbon thread. Work the backstitch around each diamond for additional accent. Good finishing will turn your stitched needlepoint into a dazzling hair accessory! In this case, you will not need to block the completed needlepoint because the stretcher bars helped to keep the design's rectangular shape. Check to make sure you have all the listed finishing supplies and follow these easy steps to make a fantastic needlework hair barrette. Remove the project from the stretcher bars and cut off the blank canvas 3 to 5 threads from all edges of the needlepoint. Trim the plastic canvas to one thread less than the stitched needlework. This will act in place of foam core board to mount the needlepoint for final finishing. Center the plastic canvas on the wrong side of the needlepoint. Using the hand-sewing needle and invisible thread, make a small tacking stitch in each corner as well as the top and bottom centers of the finished needlework. Turn the excess canvas to the back of the work and over the plastic insert, making sure to miter the corners. Whipstitch the canvas in place, being careful to sew around each plastic square without disturbing the needlepoint stitches. Cut out a piece of backing fabric to match the prepared needlepoint in the previous step. If using sticky felt, center the felt over the back of the canvas and press to secure. For faux ultra-suede or other lining fabric, use the hot glue gun to place a bead of glue in the center of the plastic to hold the lining steady. Whipstitch or slipstitch the lining to the needlepoint making sure the sewing threads are not visible. Place a line of hot glue on the lining. Center the barrette blank over the glue and gently roll the blank to either side until it is secure. Let dry thoroughly. When dry, tack each end of the barrette blank to the needlepoint for added security and strength. Your needlepoint barrette is now ready to wear and enjoy!